What Exactly Is a Tariff? How you are charged for power depends on how your meter is set up. Most residential meters in Australia are billed for power on a single rate tariff. That means you pay a single rate for power no matter what the time of day that power is consumed. However some meters are set up differently and have different tariffs. This is because there are a number of different ways to charge for power. That’s why GloBird always ask for your address before we give you a quote, because we need to make sure we quote for the actual tariff at your individual meter. Providing your postcode is not enough to give you an accurate quote. A single rate tariff is the most common tariff for Australian residential electricity customers. You pay the same rate for electricity regardless of time of day you use energy. A single rate tariff is sometimes called: flat rate, standard rate, anytime rate, or peak rate. Some appliances can be charged a controlled load tariff, for example: slab or underfloor heating, or electric hot water systems. Often the controlled load appliance has its own meter and is an appliance that runs overnight. This tariff is also known as “Peak / Off-Peak” and is one of the most cost effective tariffs for the average Aussie household. However the network companies have now closed this tariff to new entrants. If you are currently on a peak / off-peak tariff, be careful not to switch to another tariff unless you’re confident the change will be for the better, because you will not be able to go back. A flexible tariff is similar to TOU mentioned above, only instead of having two rates depending on the time of day you use power, it has three rates. See the below example. The price of electricity is lower than the peak rate and higher than the off-peak rate, when there is a reduced demand for electricity. Peak: The price of electricity is higher during the ‘peak’ times, typically on weekday afternoons and evenings, when the demand for electricity is the highest. Shoulder: The price of electricity is lower than the peak rate and higher than the off-peak rate. Off-peak: The price of electricity is lowest when the demand for electricity is the lowest. 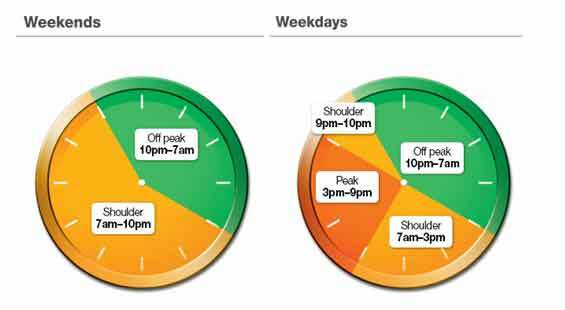 Generally the peak period applies 3pm to 9pm Monday to Friday, off-peak period applies 10pm to 7am every day, and all other times are shoulder. The times quoted are eastern standard time. Your meter’s clock does not adjust for daylight savings time, so these periods shift by one hour during daylight savings period. For example peak period would be 4pm to 10pm Monday to Friday during daylight saving time. It’s very common for houses in the same area to have different tariffs.